The most compact digital clock anywhere! A cool thing in chess clock design . . . a digital folding clock! 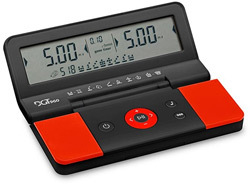 With a physical size of only 5.5" in length, 2.6" wide and 1" high, the DGT960 game timer has all the features a chess player needs in a clock for tournament or blitz chess -- bonus and delay modes, a timer that will count down or count up (great for Scrabble or Go games), a move timer, and memory capabilities that will remember and save the last time control used. In addition, this clock is easy to operate and has a large display screen of approximately 5" x 1". The DGT960 also generates 960 random starting positions, which was an idea developed by the late Bobby Fischer (Fischer Random Chess), with the hope that players would be able to start playing a chess game from "any" position set up on the board, thus eliminating the need to "memorize" openings. The DGT960 will generate all 960 random starting positions with the click of a button! The best part, however, is that when you have finished playing with this clock, you can fold it (battery will automatically go off when folded so you don't have to worry about pressing an "off" button every time) and then put it into your pocket! The DGT960 comes with an internal button cell battery which should last 4 years of average use with the sound signal turned on -- or 6 years with the sound signal turned off. The accuracy of the clock is better than one second per hour. Includes one-year manufacturer's warranty.